WeissCANNON, a true innovator in the world of tennis string manufacturing, is highly respected due to the quality and diversity of the product line they have developed. 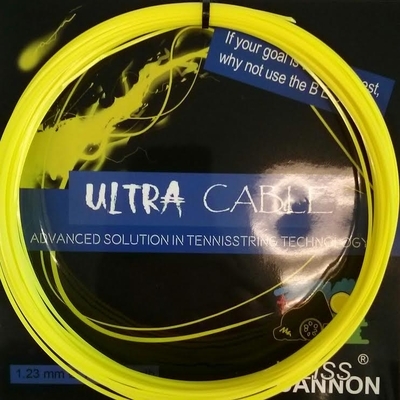 The Ultra Cable represents the first sharp edged string the company has produced. The wait has been worth every nano-second, because Ultra Cable with it's 4 fuzz devouring edges is a spin monster! Advantage: Sharp edged strings, especially those with the aggressive 4-sided design, have previously been impressive at producing some eye-popping spin, but not as strong in terms of overall feel and quality of play. The Ultra Cable takes a back seat to no one in the area of spin production while offering solid all-around performance.